On May 1 2018, Blockchain Foundry Inc. appointed Earl Flormata as Chief Marketing Officer. Earl has over 15 years of experience in sales, marketing and technical leadership and is responsible for the Company’s overall marketing strategy. The Company is also actively recruiting for a Head of Business Development and expects to provide more details on this appointment soon. General Bytes have begun work to integrate Syscoin onto their well-known ATM platform. This will potentially allow you to buy and sell Syscoin for cash at one of their 1670 ATMs, with 121+ FIAT currencies in more than 41 countries around the world! Syscoin integration into the Ledger hardware wallet is ongoing, and we are currently at the ‘feasibility’ stage of their process. On Tuesday June 12th at 10.30pm UTC, rising Crypto Vlogger ‘CryptoCandor’ will be conducting a live interview with Dan Wasyluk (CEO) and Sebastian Schepsis (CTO) from Syscoin’s parent company, Blockchain Foundry. 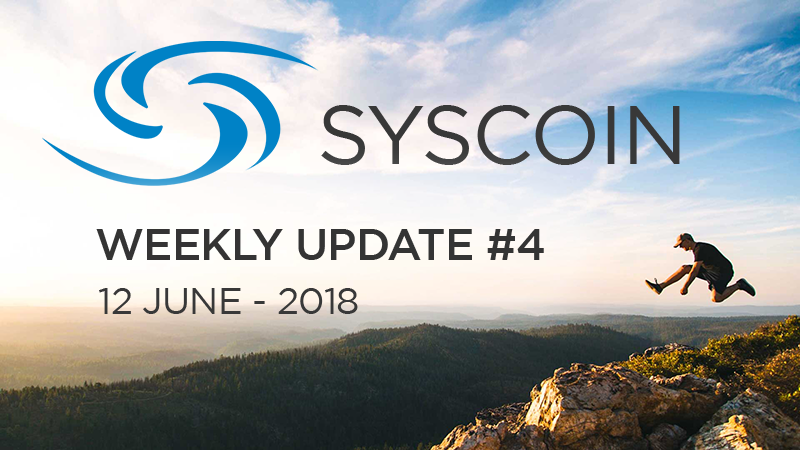 Syscoin: Security or Utility Token? This is an oft-asked question in the Syscoin Slack channel. The answer will determine what kind of legal scrutiny Syscoin receives from government regulators such as the SEC in America. Within the USA security tokens are being watched closely by the SEC and specific requirements exist to trade these tokens, which may present obstacles (such as exchange de-listing) to crypto projects that fail to meet these requirements. However, if a token can pass a test called the Howey Test it could be classified as a utility token, and under these circumstances may not need to meet these SEC trading requirements. A cryptocurrency, used as a payment. A security token is backed by a contract for an investment. Examples are stocks in which a buyer invests to receive profit like a dividend. A utility token is a token which gives (future) access to products or services (e.g. comparable to a license to play a game or a gift card). Syscoin: What kind of token? We have yet to receive official confirmation from the team on their view of the Syscoin token status, although recent comments from a team member seen in the Slack channel have led us (SCMT) to believe it could be classed as a utility. On July 1st the Coin Payments coin (CPS) airdrop snapshot will record the balance of all Syscoin Aliases on the new 3.0 chain. In Blockmarket 3, it will be easy to make an alias and attach this to an (existing) address so don’t worry about missing out! The airdrop itself is also scheduled for July 1st! Please follow us for all the latest community news via our SCMT Twitter account, as well as hot-off-the-press Syscoin and BCF updates. The Syscoin team will also share our posts via their official social networking channels, to help spread the word. We have set aside $2000 worth of SYS this month for community members to apply for, and we will conduct a poll that will enable the community to vote on which proposal to fund. If you want to apply for funds, please fill out this form here before 24th of June! 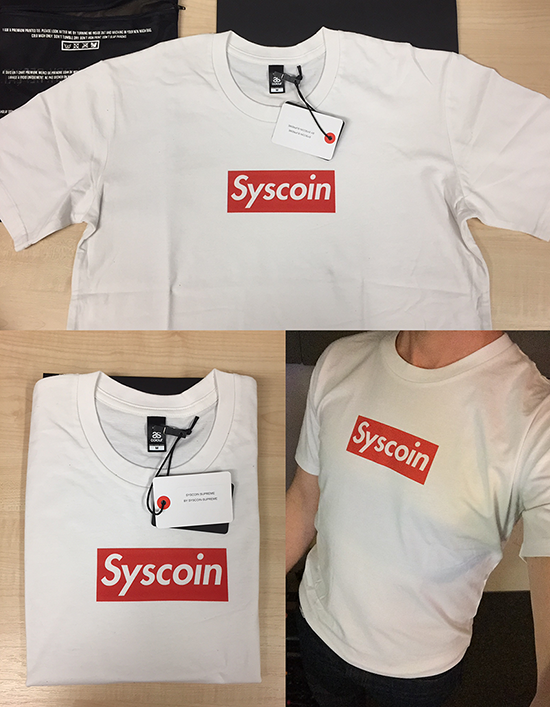 Last week we launched a range of Syscoin merchandise of which ALL profits go to Save the Children (global) and the NSPCC (UK). Again, can’t wait for BM3? Please find a step-by-step guide here to create an Alias with the SYSCOIN QT 3.0.4.1 wallet. The step-by-step guide is also made available in a video format by community member JohnP here. At the moment of publishing there are 1057 masternodes online. Masternode daily reward calculation: 37411.2 SYS per day divided across the number of active masternodes (Currently ~1057).